This traditional style chesterfield sofa is the perfect way to update a classic living space. 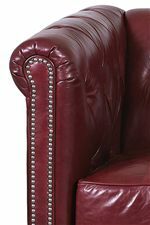 With button tufting along the back, the sides of the tuxedo arms and along the front rail this sofa brings awesome style to your home. X-Innerseat cushions make this stylish piece a comfortable addition to your home. 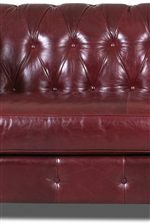 Available in different leathers and fabrics, this sofa can be customized to fit your style. The Beech Mountain Traditional Chesterfield Sofa with Rolled Arms and Tufting by Klaussner at AHFA in the area. Product availability may vary. Contact us for the most current availability on this product.